Is FDA About to Greenlight a Drug Banned in Other Countries? If enough people raise their voices in protest, we can prevent it. Action Alert! Remember the controversial diabetes drug Avandia? In 2010 we told you about two FDA drug safety reviewers who warned the agency that Avandia posed serious risks of heart attack and heart failure when compared with other diabetes drugs. Since then, the drug has been removed from the market in most countries and has been under severe restrictions in the US. Last Thursday, in a combined meeting of separate FDA advisory committees, 20 of 26 panelists voted to recommend removing or modifying Avandia’s highly restrictive label and distribution system. Five voted to keep the restrictions in place, while one panelist voted to remove the product from the market altogether. There has been only one large, randomized trial for the safety of rosiglitazone, the drug that is marketed as Avandia. That trial—sponsored by GlaxoSmithKline (GSK), the drug’s manufacturer—was called RECORD (Rosiglitazone Evaluated for Cardiac Outcomes and Regulation of Glycaemia in Diabetes). Serious flaws were found in RECORD’s methodology, its results were questioned, and the trial was widely discredited. Duke University’s Clinical Research Institute (DCRI) was selected for the re-adjudication, and they found that the risk for cardiovascular death, myocardial infarction (MI), and stroke to be virtually the same as the original study concluded. Because these new results reaffirmed GSK’s findings that the drug was no more unsafe than other diabetes products in its class, Thursday’s panelists were sufficiently reassured that the drug was safe enough to lift restrictions. In 2005 and 2006 GSK secretly conducted an analysis of cardiovascular safety of Avandia, and concluded that the drug increased the risk of heart attacks and related events by 30%. Since two-thirds of diabetics eventually die of cardiovascular complications anyway, this 30% hike is terrifying. In 2006 GSK informed the FDA’s Center for Drug Evaluation and Research (CDER) of the secret analysis, but FDA and CDER agreed to conceal this hazard from patients and practitioners. During a public hearing, independent FDA statisticians reported an 80% increased risk of heart attack. Avandia is estimated to have caused 83,000 heart attacks in the United States alone. Adverse effects caused by the drug are currently the subject of over 13,000 lawsuits against GSK. As of July 2010, GSK has agreed to settlements on more than 11,500 of these suits. Last year, GSK pled guilty of criminal conduct, partially for concealing the hazards of Avandia. The company paid a $3 billion fine—the largest in US history. On top of that, key members of the 2010 advisory committee that decided to place restrictions on Avandia in the first place were not part of the 2013 meeting. Of the twenty-seven member panel, fourteen of the experts were on the panel last time, and they were the people with a more favorable attitude toward Avandia. This is in contrast to the other experts who did not serve on the panel a second time—like Steven Nissen, who was one of the most outspoken critics on the panel. FDA claims all panelists were invited, it does not appear they made a huge effort to ensure their participation; Nissen says he was not re-invited. With all of the big nay-sayers out of the picture, it’s no surprise the panel voted to lift the restrictions on this dangerous drug. FDA should focus more on advisory panelists who have true conflicts of interest. A 2007 law placed caps on the number of waivers that could be granted allowing experts with conflicts of interest; a 2012 law removed those safeguards. When there are no restrictions on experts with conflicts of interest serving on FDA advisory panels, more drugs with dangerous side effects could certainly enter the market. Action Alert! 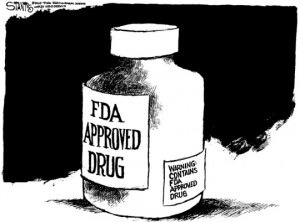 The FDA is not obligated to follow its advisory committee’s recommendation, though they usually do so. Moreover, there is no regulatory deadline by which they have to make a decision. If there is enough public pressure, perhaps this will force the FDA to reject the advisory committee’s decision on Avandia—or at least postpone any action indefinitely. Please send your message to the FDA about the dangers of Avandia! This page contains a single entry by sal published on June 18, 2013 5:08 PM. GMO, Global Alert 2yr Scientific Study Certifies GMO Is Poison & Cancer Causing was the previous entry in this blog. Virulent E. coli: A Gift from Agribusiness is the next entry in this blog.